As we all know, February 14th is Valentine’s Day – and it also happens to be the birthday of Pearl Linford, Finn Blacklin, James Cardigan, and Marie Jessup in the Valentine series. But according to Leslie Knope from Parks and Recreation, February 13th, the day before Valentine’s Day, is Galentine’s Day, a day all about ladies celebrating ladies. Whether you’ve read all three books in the Valentine series or whether this is your first introduction to the world of Pearl: enjoy this story, and happy Galentine’s Day! ‘Philllllllllllllll,’ I moan into the phone. She doesn’t need to ask any more questions. ‘Mum, can you give me a ride to Pearl’s?’ she calls. My older brother Shad is asleep (he runs his own tech company and he mostly does business with people on the other side of the world, so he’s nocturnal) and I don’t want to wake him, so I wait for Phil out on the verandah, even though it’s a million degrees and my school uniform is sticking to my skin. It’s perfect swimming weather, and I fantasise for a second about hurling myself into cold deep water and how good it’d feel to be out of the humidity for a bit, but swimming just makes me think about Dave, and that makes me want to hurl myself into cold deep water from an extremely high cliff. A black bird takes flight from one of the nearby eucalypts and goes soaring into the distance, scared off by the noise. It’s a mood, honestly. I wouldn’t want to hang out with me right now either. ‘Thanks, Mrs K,’ I say. Privately, I think that she’s being a little OTT – I mean, she and Phil’s dad were married and had, you know, a kid, and Dave and I were dating for all of three weeks – but I still appreciate the sentiment. ‘I hope so,’ I say. ‘Pippa, you call me when you need me to pick you up, okay?’ Mrs Kostakidis says, then gets back in the car and drives away. ‘How did he react?’ she asks. I take another piece of baklava. It’s the most dangerous stuff, I swear. No one makes baklava like Phil and her mum and her yiayia. My mouth is full, so all I can make is a weird garbled sound of exclamation. Pastry crumbs fly out of my lips. I bet if Dave could see me now, he’d wish he’d been the one to do the dumping. ‘You never really liked Dave,’ she finishes. I swallow. ‘Yes, I did,’ I protest. God, me rejecting Dave would have made so much more sense if we were on The Bachelorette. ‘I’m sorry, Dave, you’re really nice, but you’re not the guy for me,’ I’d say, and he’d be all, ‘I understand – I just want you to be happy’, and then go away and cry behind, like, a tree or whatever. And then Cardy would walk up and I’d be all, ‘It’s you, James Cardigan, I love you’, and he’d smile, and then he’d kiss me, and he definitely wouldn’t do that washing machine thing with his tongue that Dave sometimes did, and we’d go on a nationwide tour where everyone told us what a cute couple we were and we’d live happily ever after. Another boy’s face drifts across my mind. I slap it away. No. Me and Cardy and the Bachelorette victory tour. That’s what I want. That’s why I freaked out and ditched Dave. Definitely no other reasons. I should explain about the birthday party thing, because it’s a bit confusing if you don’t know the backstory. 1) The local newspaper is still low-key obsessed by the fact that four! kids! were! all! born! on! the! same! day!, and so almost every year around our birthday, they line us up and take a picture and put a little story on, like, page 9 that’s all ‘Ooooh, what are those four Valentine kids up to now?’ My sister Disey works at the paper and she says that the editor refers to it as ‘Haylesford Seven Up’, which is apparently some old documentary series where they check in on the same bunch of people every seven years. Personally, I can’t imagine why anyone finds it interesting, but . . . eh, there you go. 2) It makes organising birthday parties incredibly difficult. Despite the whole Haylesford Seven Up thing – and despite the fact that I’ve been in love with Cardy since we were, like, twelve – the four of us aren’t BFFs or anything, but we’ve resigned ourselves to the fact that unless we want to tear our year group asunder and force them to make big political decisions about whose birthday party to attend, we have to combine forces and have a joint event. There are positives and negatives to this. A positive is this that people always come to my birthday party. A negative is that every year I have to share said birthday party with Finn Blacklin, who is possibly the most trash human on the face of the planet. They put us next to each other in the newspaper photo this year. He didn’t say anything to me, but you know when you can just, like, feel someone there? And then they’ll do something totally innocuous – like, in this case, he got a message so he checked his phone – and somehow no one in the world has ever done anything so annoying, ever? And the fact that you know you can’t tell them how annoying they’re being because objectively they’re being completely normal only makes you more annoyed? That’s my relationship with Finn in a nutshell. It didn’t help that the night before that I had a dream about him where – no no no no. Not thinking about that. Anyway. The party. Our actual birthday is on a Sunday this year, so we’re having the party tonight, on February 13, at Marie’s place. Except I might not go because I have nothing to wear. Okay, that’s a lie. There’s a dress that I planned to wear. But in the dream that I’m not thinking about, I was wearing it, and if I wear it, I’ll think about the dream, and I am not thinking about the dream. I pick up my phone. Normally, when I have fashion questions, I call my friend Tillie, but she’s with her family in Vietnam right now. I could call Phil – and she’d do her best – but fashion isn’t her wheelhouse. It really is. The dress is green and knee-length, a little bit floaty, but summery and casual enough that it doesn’t look like something you’d wear to the Year Ten formal. I’m already tearing the dress I’m wearing off and stepping into the new one. ‘Can you zip it up?’ I ask, holding my long hair off my neck. She does. ‘What do you think?’ I ask. I look at myself in the mirror. She’s right. Once I change out my black T-shirt bra for a strapless one, add a bit of jewellery, and do something to my hair, the dress is going to be perfect. Disey smiles at me in the mirror. ‘You’re going to look like a fairy princess,’ she says. ‘Happy birthday to you too,’ I say, hugging her back. She hands me a vodka cruiser. I don’t really drink much, but I take it. ‘Anything you need me to do?’ I ask. Marie clinks the neck of her bottle against mine. ‘Happy sweet sixteen,’ she says. For a moment, we’re silent, and even though the music is blaring and people are talking and the world is loud around us, it feels like we’re the only two people in the world. I know he doesn’t mean anything by it, but man, I would really like to kick Julian in the face. I go off looking for Phil. I know she must be here somewhere – if there’s one thing I know about Philippa Kostakidis, it’s that she’s never, ever late – but the place is so packed I can’t see her. Elbowing my way through the crowd, I see Simon Anelli heading in my direction. I’m not sure if he’s coming for me or he’s just generally moving my way, but he already looks hammered. I have absolutely no desire for a repeat performance of the last time we were at a party together (the only reason why Dave, and not Simon, was my first kiss was because when Simon lunged for my face he missed and got my ear instead), so I duck around a corner. And run straight into Finn. ‘You too,’ I reply automatically. Oh no no no Finn Blacklin, you’re not ruining another dress for me. No chance in hell. ‘Shouldn’t you be saying that to your girlfriend, instead of hitting on me?’ I snap. As if I would hit on you, I hear underneath it. That’s hilarious, Linford. I try to imagine what Holly could have done to get grounded, and every single answer involves Finn. My heart falls into my stomach and disintegrates. ‘Want to dance?’ he asks. ‘No,’ I say abruptly, and leave. I find Phil talking with a bunch of other girls from school. They all wish me happy birthday, and we migrate out to the dance floor (well, ‘floor’ is a bit of an overstatement – the lawn where everyone is dancing) and dance till we’re all sweaty, until Marie cuts the music and announces it’s time for cake. Something about the fact that he’s definitely having a good time when he hasn’t seen me all night feels incredibly insulting. The four of put our hands on the knife together to make the first cut in the cake. My hand is sandwiched between Cardy’s and Finn’s, and I can’t help but look at their wrists, watch the muscles in their forearms working. We’ve done this basically every year since we can all remember, and somewhere along the line, their hands stopped looking like kids’ hands, and started looking like men’s. I liked that about Dave. He was two years older than me, and when I looked at his hand resting on my knee when we went to the movies, it made me feel so adult. God, I wish he were here. He disappears into the crowd. I look after him. ‘Hmmm?’ I say, watching Finn kiss Holly. ‘Yeah, something to do with her aunt or – oh, hello,’ she says, as Julian comes up behind her and puts his arms around her waist. Julian pulls her away. The line for cake is long and snaking, even though Cardy’s serving it as fast as he can. Over near the front door, Holly has her arms around Finn’s neck and has buried her face in his shoulder. One of his hands is resting gently against the back of her head.
. . . and I’m standing alone, watching them, like a weirdo stalker. I look away, but I don’t know where else to put my eyes. ‘You haven’t got cake yet,’ I protest, as she pulls me toward the kitchen. I obey – but it’s only because my eyes have filled with tears. Inside the same Tupperware container she uses for baklava, Phil’s brought cupcakes. Happy bday Pearl, she’s iced on them. I gesture at the piece of birthday cake. I laugh, but it comes out weird and choked, because I am definitely about to cry. ‘Happy sweet sixteen, Pearl,’ Phil says. Enjoyed Galentine? 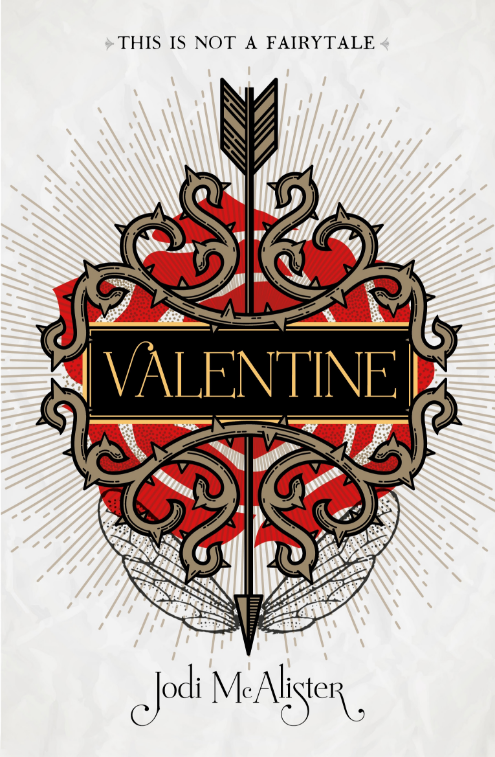 Make sure you check out Valentine, the first book in the Valentine series, out now from Penguin Teen Australia.